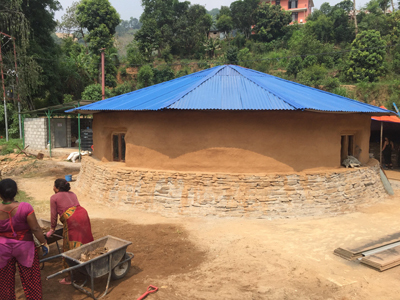 The UNM4Nepal team recently returned from their second successful trip to Nepal, where they built a Women’s Community Center in one of the earthquake-stricken rural districts. UNM4Nepal, a humanitarian engineering group developed in the Civil Engineering Department, completed the second phase of their project with the construction of a dodecagonal parallel Pratt steel truss roof, exterior flat stone façade wall, and recycled flat stone tile flooring. 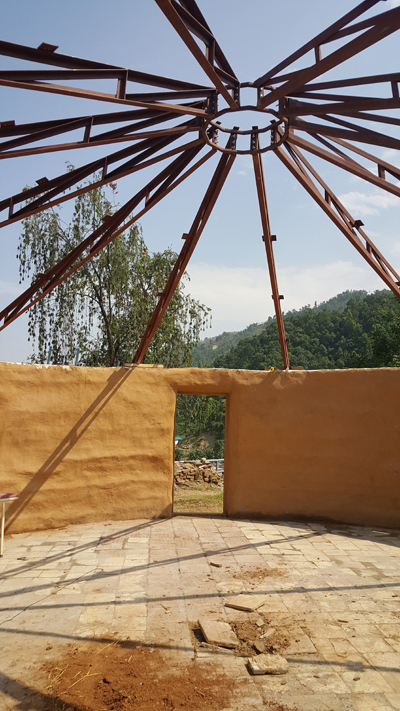 The circular earthbag structure is in the footprint of an old health clinic that collapsed during the 7.8 magnitude earthquake that struck Nepal in Spring of 2015. The team used locally-sourced material, construction demolition waste (CDW), hired local labor, and hosted an All-Hands Meeting with local community members as part of their building resilient communities’ initiative. See a virtual tour of the Women's Community Center in Nepal!